This amazing My Babiie Everything You Need Travel System Bundle is perfect for starting out! 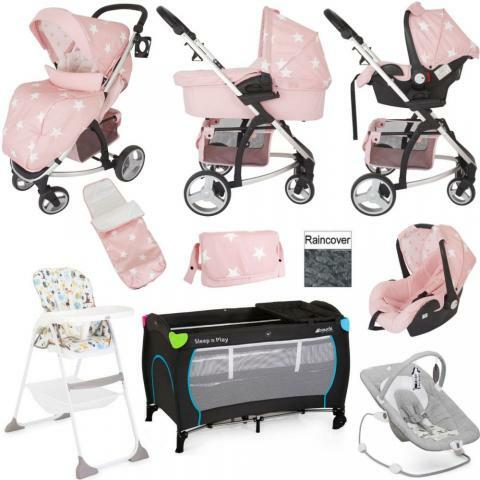 Complete with stylish multi – mode travel system with three fab modes available; forward facing, carrycot and car seat the MB200+ with matching footmuff and changing bag is the only pushchair you’re ever likely to need. The innovative lightweight travel cot with raised bassinet is perfect when travelling or for simply at home. With its unique compact fold mechanism, reclining seat and removable feeding tray the Mimzy Snacker highchair is perfect for mealtimes and easily stores away after use. The beautiful wish bouncer utilises baby’s natural movements in order for it to bounce, or can be set off with a gentle push. With a Cocoon Shaped, cradling seat this offers a soothing and relaxing chair for your baby. This fabulous package grows with your little bundle.